Kansas City reunites an Impressionist masterpiece by Claude Monet immersing the viewer in the color of time. The motif’s essential is the mirror of water whose aspect is constantly being modified by the changing sky reflected in it, and which imbues it with life and movement. "They are far beyond my old man powers and despite everything I want to succeed in conveying what I feel. I destroy some … I start over again … And I hope something will finally come from so many efforts". From April 2011, three panels of a sublime, 42 ft 6 in-long (13 m) water lily panorama, painstakingly painted over and over again between 1915 and 1926, will be re-united in an exhibition titled … you guessed it, Monet’s Water Lilies. 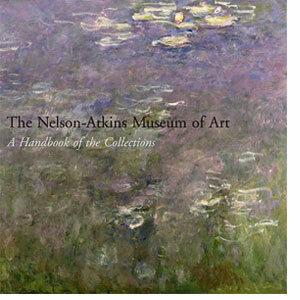 The Nelson-Atkins Museum of Art, The Saint Louis Art Museum and The Cleveland Museum of Art each own one panel of the triptych and the exhibition will offer a rare opportunity to see the panels together in Monet’s original conception, the first time that this reunion has occurred for more than 30 years. The triptych panels were amongst the contents of Monet’s studio at his death, most stamped with a mark mimicking the artist’s signature and then distributed far and wide. It is said that a triptych in the Museum of Modern Art is the only other multi-panel work by Monet in the United States. Also included will be revelatory conservation work which highlights the extent to which Monet obsessively changed his composition over the years. In part this was because, from perhaps as early as 1908, his eyesight was deteriorating. In 1912, he told Gustave Geffroy that his doctor (Dr Valude) had diagnosed cataracts: the right eye no longer sees anything, he said, the other is also slightly affected. In 1921, Monet poignantly told a reporter, Alas I see less and less, but, he added, with indomitable resolve: I will paint almost blind as Beethoven composed completely deaf. At last, in 1923, at 83, pressured by his dear friend Georges Clemenceau, a terrified Monet had three operations on his right eye; eventually the cataract was successfully removed. His sight greatly improved (he also wore corrective glasses), and Monet destroyed many of the cataract period canvases, but kept those that he felt were good. Some he reworked, others were never completed. The KSC Water Lilies panorama is one of the successful surviving major works of this long difficult period of struggle, work and reworking of pictures. Such works also represent Monet’s assimilation of Japanese aesthetics and his gestural, sketchy Impressionist technique at its best. Japanese ink and screen paintings, which Monet much admired, tend not to have a single focal point. Rather the compositions are about combining or scattering elements, vertically or horizontally, over the surface, drawing the eye here, there and everywhere (As in the 'pampas grass' screen painting in the Cleveland collection). In the KSC panorama, Monet, similarly, has created a “Japanese” design of lily pad clusters, disposed in a rhythmic zig-zag pattern across the triptych. Monet never visited Japan, but eagerly, in the 19th Century fashion, collected Japanese prints, which decorated the walls of the Giverny house. More importantly, though, his decision to abandon the isolated rectangle format of his earlier exhibition easel paintings and to extend his late pictures into very long panoramas stretched along the length of a wall, most likely was influenced by his interest in monumental Japanese screen paintings. Some of these were nearly two metres high and over seven metres long, and traditionally functioned as integral elements in Japanese architecture: as ceremonial backdrops for dignitaries, as room dividers, and sometimes as actual sliding walls. So say Monet experts Virginia Spate and David Bromfield (Monet & Japan (2001): 58), who state that Monet would have seen actual Japanese ink and screen paintings in situ in rooms, as well as in photos in books, in Paris “in private collections, art dealers’ galleries and auctions, as well as at the Japanese exhibition in the Exposition Universelle of 1900”. And Monet would have learned about the scale and interior function of screen paintings filling the walls of Japan’s monasteries, temples and palaces from his copy of (curator of Far Eastern art in the Louvre) Gaston Migeon’s 1908 book about the “sanctuaries of art” in Japan. Monet was no Zen Buddhist, but it could be said that his grand water lily panoramas share this much with Japanese screens: they invite calm meditation. With no horizon line in the KSC work, there is no way to measure the space, and (viewed close to) the viewer will find his/her frontal and peripheral vision enclosed in a serene painted realm. not only from one season to another but from one minute to the next, since the water lilies are far from being the only thing in the show; as a matter of fact they are merely the accompaniment. An accompaniment, indeed, to the main show of rippling water, passing clouds and swaying trees and bobbing water plants. Reflection and reality, stillness and movement, all brilliantly indicated through layer upon layer of paint: how did he accomplish these extraordinary effects? 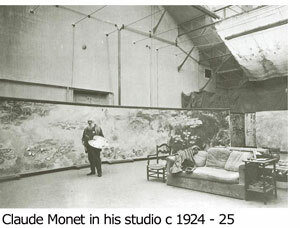 ─ this is probably the question that engages every painter who peers closely at Monet’s water lily pictures. While Japanese art evidently gave Monet some significant conceptions of interest to him, it must be acknowledged, of course, that his wizardry lay in his entirely unique ability to conjure the fugitive effects of light and color in the Western medium of oil paint. In his earlier landscapes, Monet had become particularly successful at using layers of varied brushstrokes to capture the vibration of heat haze in the air, imbuing scenes with a glimmering effect which became known as the “Impressionist shimmer”. He realised he could introduce a similar sensation of shimmer into his lily pond subjects; and in the many-layered KSC panorama we see a very abstracted pattern of thin paint layers along with thick strokes and lumps of unmixed color in parts and a great variety of fluid brushstrokes and washes. But stand further back (as Monet did) and see this “abstraction” coalesce into the “pond” image. Most prominently, in some parts, is a final layer of gestural, looping lines which “draw” the lilies, perhaps a little like Japanese calligraphy only in cream paint - the ragged or blurred edges suggesting a corona of trembling white light around the edges of the flowers. 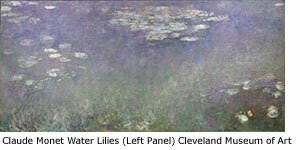 The panorama’s vivid coloristic oppositions create a push-pull effect: in what was one of the artist’s favourite color schemes, scales of cream, yellow, pink, red and violet, indicating the diaphanous lilies, are held in tension with complementary blues and greens depicting watery depths with waving fronds of water plants. It’s appropriate that the last word on the Nelson-Atkins Museum’s impressive Water Lilies panorama be left to the grand old man himself. 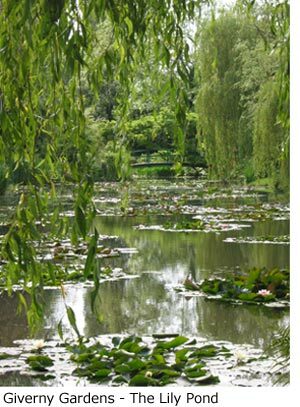 The intention, Monet explained, of his last water lilies decorations was to present a haven of peaceful meditation, a gift to modern man with his overworked nerves. And for that, and so much more, we can be eternally grateful.